5 Best Penny Stock Brokers Review & Comparison U.S.A. Looking For A Reputable FX CFD Broker In The UK? Discover The Top 3 UK Broker Platforms, But Also 2 Great Alternatives. Forex.com: Best For Beginners & Experienced Traders, Direct Market Access Via ECN, MT4 & VPS Hosting, Great Trading Conditions & Backed Up By Gain Capital A NYSE & FTSE Listed Corporation. 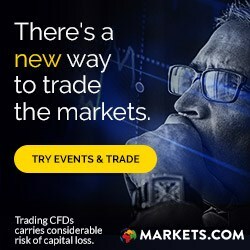 Markets.com: Good for traders wanting a great selection of Share, ETF and Indices CFD's to trade combined with a simple online trading platform. Vantage FX: Simply The Best Trading Conditions, Most Complete Platform & First Class Execution Speed & Costs. Add cTrader, MT4 & 5, ZuluTrade and Regulated By ASIC Australia You Have A Great Broker. Trade.com: Great for Trading US Stocks & ETF's with Beneficial Ownership & Straight Through Processing (STP) of Trades, Plus a Large Selection of CFD's on Stocks, Forex, Bonds and Commodities. 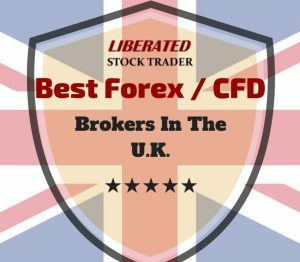 Our 1,000s of hours of testings the most respectable Forex & CFD Brokers across the globe reveal the three best UK based Forex Brokers, plus 2 great alternatives for UK clients. Forex.com one of the biggest UK brokers and Vantage FX one the best global brokers make the cut. Both offer direct market access via ECN with a tantalizing suite of tools and razor thin margins. Make your choice, are you a power trader searching for the ultimate platform, then choose Vantage FX, or do you need a strictly UK based FTSE 250 and NYSE listed company that also offer a great reputation and service, then choose Forex.com? The final alternative is Trade.com who uniquely offer US stock and ETF trading with beneficial ownership of the assets, meaning you own the stocks and a personal account manager. Read one to find out more. The UK was the birthplace of the contract for difference (CFD), Holland was the birthplace of Foreign Exchange Trading. Bring them both together and the UK has some of the biggest Forex CFD brokers operating today. But our friends in Australia and Cyprus also have some great brokers. 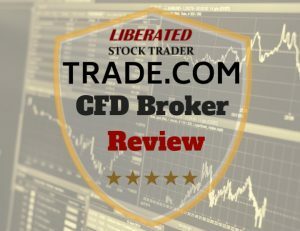 This review will cover the Top 3 UK based CFD Brokers, based on independent customer satisfaction ratings and service quality. But then also offer up 2 alternatives from our cousins across the globe in Australia. Whichever broker you choose you will be in great hands. Markets.com: Good for traders wanting a great selection of Share, ETF and Indices CFD’s to trade combined with a simple online trading platform. 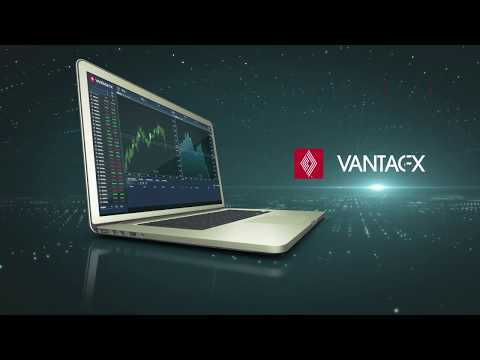 Vantage FX: Simply The Best Trading Conditions, Most Complete Platform & First Class Execution Speed & Costs. Add cTrader, MT4 & 5, ZuluTrade and regulated By ASIC Australia and you have a great broker. Trade.com: Great for trading US stocks & ETF’s with beneficial ownership and straight through processing (STP) of trades, plus a large selection of CFD’s on Stocks, Forex, Bonds and Commodities. Based in Cyprus and regulated by Cysec, Trade.com services the U.K. market. Forex.com UK: Best For Beginners & Experienced Traders, Direct Market Access Via ECN, MT4 & VPS Hosting, Great Trading Conditions & Backed Up By Gain Capital A NYSE & FTSE Listed Corporation. Gain Capital PLC a FTSE 250 and NYSE listed company has been around since 1983, but the launch of their new brand Forex.com has brought to the table an excellent mix of Direct Market Access (ECN) & Instant Execution. Platforms include MetaTrader 4 & Virtual Private Server (VPS) hosting and in addition their own innovative advanced trader suite of tools. Add to this, clear and transparent pricing + tight spreads and low share trading commissions and you have the best UK based Forex & CFD broker. Forex.com UK is a relatively new offering from a well-established company so there is not a large body of reviews on trustpilot.com. Alternatively, on the ForexPeaceArmy (FPA) website the reviews are mixed with very happy customers and some not so happy. The overall FPA rating is 2 stars. Taking this into consideration we assume Forex.com is a reputable broker. My interactions with the company have always been first class. Always do your own research before deciding. Forex.com offer market maker (dealing desk) services but also offer straight-through processing (STP) and electronic communications network (ECN) order execution. I would recommend selecting the STP or ECN options as they remove any doubt of conflict of interest, which is the biggest complaint that most dealer desk brokers receive. 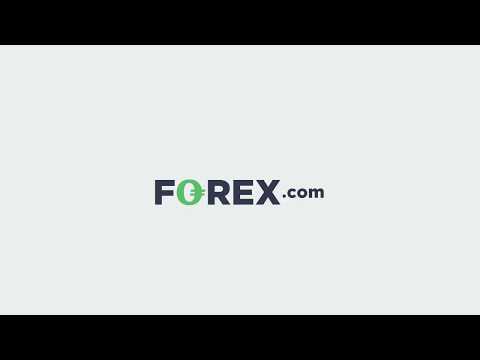 I spoke with representatives of Forex.com to get clarity on this and to confirm which type of trading is allowed. The sign of a poor broker is they do not allow High-Frequency, Trading, Arbitrage or Scalping. Forex.com do allow these types of trades, which essentially means they are not trading against you in the ECN or STP models. Forex.com UK offers a huge selection of 80+ foreign exchange (Forex or Fx) Pairs for Trading. All the common pairs such as EUR/USD as EUR/GBP are covered, plus a host of exotic pairs. Leverage is available up to 30:1 but of course, the leverage available to you depends, as with all brokers, on your account balance and experience. Leverage of 30:1 is for retail customers and if you qualify as a professional investor your maximum leverage can increase to 1:400. Of all the brokers we have reviewed this is the largest selection of Fx pairs and the highest professional account leverage. Trading Crypto is hot right now, and Forex.com UK currently offers 8 different Cryptocurrency trades. You can trade Bitcoin, Ethereum, Litecoin & Ripple against the Dollar, Pound or AUD. Crypto leverage is typically 1:2 for retail accounts, good brokers in this space tend to keep the leverage low to be able to service the trades in the volatile environment that is cryptocurrency. For professional accounts, this rises to 1:20. With a portfolio of over 200+ tradeable shares of the largest US & UK stocks, Forex.com UK offers a reasonable selection, higher than the typical broker offering of around 100 shares CFD’s. In terms of Indices, all the major benchmarks are covered. As with many of the other Forex brokers, there are no Options or Bond trading opportunities. Forex.com UK aims to keep it straight forward when it comes to tools. You can trade from your tablet, smartphone, and PC / Mac and your watchlists and setups are available on all devices. There are no costs associated with using the platforms and no complex installation for the Web Trader platform or mobile apps. The beauty of this platform is that it is extremely easy to use and intuitive, whether you are using your phone or have the WebTrader program installed on your PC. The App has a 3-star rating on the Play store and in the Apple store, so mobile trading might not be the smoothest experience so far, but I am sure they are working on it. As a frequent Forex Trader, the quality and range of the software available are important. There is no point in having low trading costs and great margin interest rates if you cannot trade due to poor software. If you have a preference for the industry’s most established Forex trading packages like MetaTrader, then the choice will be clear. Forex.com has a broad selection of high-quality platforms available. The industry-leading Forex Trading Software is MetaTrader and Forex.com offer MetaTrader 4. Add to that the ability to plug in and use NinjaTrader, which has a massive and passionate user base who collaborate and contribute lots of systems and expert advisors. Also, for Web Trading Forex.com are utilizing TradingView. TradingView won our Best Stock Market Analysis Software Review, so you know you are getting a high-quality web trading system. Forex.com is owned by Gain Capital Holdings, who are a registered corporation and floated on the NYSE Ticker:GCAP. They have been in operation for 17 years and have full FINRA membership and the SIPC Investor Protection, in the U.K. they are regulated by the Financial Conduct Authority (FCA). You can rest assured that the company accounts are public and transparent. Opening a demo account is free, but to start trading you will need a minimum balance of $50. Minimum balances seem to be important to some people, but from my perspective, if you cannot afford $500, you probably should not be attempting to trade CFD’s. Finally, as per regulatory requirements, Forex.com operates segregated accounts, meaning that your cash account is segregated from the accessible funds available to Forex.com, simply meaning, they cannot use your funds to trade their own account. Also, there is a Financial Services Compensation Scheme (FSCS) insolvency compensation of up to 50,000 GBP in accordance with regulations. Forex.com is the largest Forex Broker in the U.S. & U.K. and having a business that is entirely focused on foreign exchange trading enables Forex.com to provide excellent resources in this area. Forex.com is owned by Gain Capital a global powerhouse in CFD & Forex Trading. The benefit here is that Forex.com clients will receive a wealth of market insights, market analysis, and market outlook communications throughout the day. The in-house team of analysts at Gain Capital provides all the market insight you will need. In terms of customer support, Forex.com offers a 24/7 Coverage, both over the phone, chat, and email. It is surprising that not all Forex brokers offer this level of service. Forex.com is a well-established market leading CFD broker with a good reputation, which is important in this industry. They have a good selection of tradeable instruments including Shares, Indices and a huge selection of Fx pairs and Cryptocurrencies. The system and platform are designed for simplicity and ease of use from the highly rated WebTrader software to the tight spreads. If you are looking for direct ECN market access or the MetaTrader suite, then you may they may be your broker. Plus500 has been around since 2008 which makes it one of the more mature, established CFD Forex Brokers. This is reflected in the sheer size of the number of instruments you can trade. Plus500 scores very well on Trustpilot, with a 4 out of 5 stars rating and an 89% approval rating from 769 reviews. The approval rating is the total percent of reviews that are rated average, great or excellent. In fact, 62% of Plus500 customers rated the service as excellent, this is amongst the very highest in the industry. Alternatively, on the FPA website, Plus500 scored 2 stars, which is a contrast to Trustpilot. Taking both into consideration we can assume Plus500 is a reputable broker. Always do your own research. Plus500 offers a huge selection of 74 foreign exchange (Forex or Fx) Pairs for Trading. All the common pairs such as EUR/USD as EUR/GBP are covered, plus more exotic pairs such as NZD/JPN (New Zealand/Japan) and CHF/HUF (Swiss franc / Hungarian Forint). Leverage is available up to 30:1 but of course, the leverage available to you depends, as with all brokers, on your account balance and experience. Leverage of 30:1 is for retail customers and if you qualify as a professional investor your maximum leverage can increase to 1:300. Trading Crypto is hot right now, and Plus500 currently offer 13 different Cryptocurrency pairs to trade, this is the 2nd largest selection of Cryptocurrencies out of our 5 recommended brokers. You can trade Bitcoin, Ethereum, Litecoin, Neo, Ripple XRP, EOS, Stellar, Tron, Cardano, and Monero all against the dollar. You can also trade Ethereum against Bitcoin. Crypto leverage is typically 1:2 for retail accounts, good brokers in this space tend to keep the leverage low to be able to service the trades in the volatile environment that is cryptocurrency. With a portfolio of over 2,000+ tradeable shares, Plus500 offers one of the broadest selections of stocks available through CFD brokers. Recently introduced are the 7 main cannabis stocks. There is a huge selection of U.S. stocks and 20 other markets from Japan and the U.K. to Austria and Finland. In terms of Indices, all the major European and American Benchmarks are covered, plus some rather interesting combinations like the NYSE Fang+ Index, China Internet Giants Index and even a Lithium & Battery Index. With 31 Indices options, there is plenty of variation to quench the thirst of a well-researched trader. In addition to shares and indices Plus500 also offer Options trading, this is interesting because very few other brokers offer Options on the menu of services offered. For those interested in commodities, there are 20 to choose from, which is again one of the broadest collections of commodities available. The usual commodities like Oil, Gas, Palladium, Cocoa, Cotton, and Metals are covered and include livestock such as Cattle and Hogs. Plus500 aims to keep it simple and straight forward when it comes to tools. You can trade from your tablet, smartphone, and PC / Mac. There are no costs associated with using the platform and no complex installation. The beauty of this platform is that it is extremely easy to use and intuitive, whether you are using your phone or have the WebTrader program installed on your PC. The App has a 4-star rating on the Play store and in the Apple store, which is unusual, many brokers get poor ratings for their mobile software. Ultimately you know you will be getting a solid and seamless experience however and wherever you choose to trade. Plus500 have taken an innovative step by adding powerful alerting functionality to their WebTrader platform. 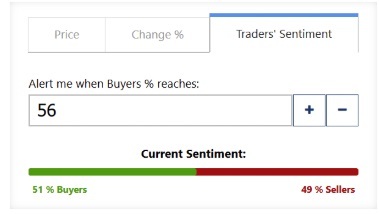 This means if you want to trade either with sentiment or against sentiment, you can configure the alert. Warren Buffett suggests one should “be greedy when others are fearful and fearful when others are greedy”. Therefore you can set an alert for a trading instrument at the extremes and implement a contrary trading strategy. Nice work from Plus500. Plus500 was established in 2008 and is one of the most established brokers in the business servicing over 300,000 customer accounts. The holding company is Plus500 PLC an FTSE 250 listed company on the London Stock Exchange. You can rest assured that the company accounts are public and that Plus500 is regulated by the Financial Conduct Authority in the U.K. Other offices are regulated by Cysec in Cyprus and ASIC in Australia. Opening a demo account is free, but to start trading you will need a minimum balance of $100. Plus500 probably get such positive ratings from their clients because of the suit of investor protection tools they have in place. Plus500 offer Negative Balance Protection which is really important for CFD traders, meaning the backstop of margin call will protect you and guarantee even if you do not meet the margin call, that you will not end up owing money to Plus500, they will execute the sale on time. Plus500 is a well-established market leading CFD broker with a good reputation, which is important in this industry. They have one of the biggest selections of tradeable instruments including Shares, Options, ETF’s, Indices and a huge selection of Fx pairs and Cryptocurrencies. The system and platform are designed for simplicity and ease of use from the highly rated WebTrader software to the tight Spread only fees. 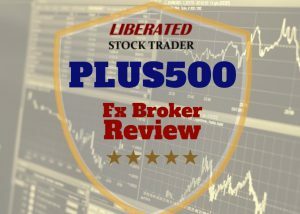 Plus500 Ltd is listed on the main market of the London Stock Exchange and offers guaranteed stops which are essential. This is why they are one of only 5 of our recommended brokers. If you are looking for direct ECN market access or the MetaTrader suite, then you may want to look at other brokers. Risk Warning: 70%+ of retail investor accounts lose money when trading CFDs with leverage. Markets.com UK: Good for traders wanting a great selection of Share, ETF and Indices CFD’s to trade combined with a simple online trading platform. Markets.com established with headquarters in the UK has been around since 2012 which makes it one of the newer CFD brokers on the market. They have an excellent selection of Forex pairs and share CFD’s to choose from This is reflected in the sheer size of the number of instruments you can trade. Markets.com scores very well on Trustpilot, with a 96% approval rating from 359 reviews. The approval rating is the total percent of reviews that are rated average, great or excellent. In fact, 84% of their customers rated the service as excellent, this is amongst the very highest in the industry. Alternatively, on the FPA website, they scored 2 stars, which is a contrast to Trustpilot. Taking both into consideration we can assume Markets.com is a reputable broker. Always do your own research. As you can see the amount of leverage available to the professional trader is significantly more, but you will have to prove that you qualify for the account, meaning, proving your net worth and trading experience. Markets.com specialize in the sheer number of tradable stock market-based vehicles, with an incredible 2000+ shares, 33 Indices and even 50 different ETF’s to trade, this is an admirable selection. They also offer a great selection of Fx Pairs (54) and a reasonable selection of Cryptocurrencies (6). In comparison with other brokers, their levels of leverage on offer to the retail trader are low with only 2:1 on Crypto and 1:10 on shares. Markets.com aims to keep it simple and straight forward when it comes to tools. You can trade from your tablet, smartphone, and PC / Mac. There are no costs associated with using the platform and no complex installation. The beauty of this platform is that it is extremely easy to use and intuitive, whether you are using your phone or have the WebTrader program installed on your PC. The Markets.com App has a 4-star rating on the Play store and in the Apple store only a 2.9 rating with many complaints, many brokers get poor ratings for their mobile software. So if you plan on trading from your iPhone or tablet, I would not recommend this broker. If using a PC or Android, it should not be a problem. Markets.com have opted to use a proprietary web-based trading application and are not using the industry standard specialist programs like MetaTrader 4 or 5 or MT WebTrader. 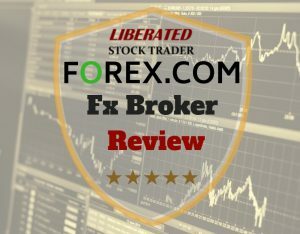 If you are looking for powerful trading, algorithmic automation or even copy trading, I would suggest looking at this review. Markets.com is the Market Maker for their clients, that means they are the dealing desk, they do not offer straight through processing (STP) or direct market execution via the electronic communication network (ECN). That means they take the opposite side to your trade. This could potentially be a conflict of interest with the client unless the broker is unscrupulous and manages the risk properly. Markets.com do have a risk policy to mitigate these circumstances. Scalping, arbitrage and high frequency trading are forbidden under the trading agreement with this broker. They are one of the newest entrants to the market having been established in 2012, but they are part of a large company – PlayTech PLC a FTSE 250 registered company specializing in betting. They are regulated by Cysec in Cyprus and ASIC in Australia. Opening a demo account is free, but to start trading you will need a minimum balance of $100. Minimum balances seem to be important to some people, but from my perspective, if you cannot afford $100, you probably should not be attempting to trade CFD’s. Markets.com offer Negative Balance Protection which is really important for CFD traders, meaning the backstop of margin call will protect you and guarantee even if you do not meet the margin call, that you will not end up owing money to the broker, they will execute the sale on time. Finally, as per regulatory requirements, they operate segregated accounts, meaning that your cash account is segregated from the accessible funds available to Markets.com, simply meaning, they cannot use your funds to trade their own account. Also, there is Financial Services Compensation Scheme (FSCS) insolvency compensation of up to 20,000 EUR in accordance with CySec regulations. Markets.com is a well-established broker and a UK FTSE 250 listed company. Their strength is the large selection of Fx pairs and Shares, ETF’s an Indices you can trade. They are good for a discretionary trader, not high-frequency traders or scalpers as they act as the Market Maker for their clients. They have a simple and effective online trading application, but the iPhone app is poor. They are regulated in Cyprus and offer negative Balance Protection and segregated account. Vantage FX has been around since 2009 which makes it one of the more established CFD Forex Brokers in the industry. Based in Australia Vantage FX are focused on enabling their clients open and transparent access to the markets while using the best platforms around, MT4 & MT5. Straight Through Processing (STP) and Electronic Communications Network (ECN) accounts also mean direct market access and lightning quick execution. Trusting the broker you are using is critical. You need to be sure that the broker is reputable, efficiently run and well regulated. To be able to assess the quality of a broker we have chosen to use two sources of ratings, because some brokers may be unfairly discriminated against on one rating website, and have great reviews on another website. We have chosen what we believe to be the best to sources for impartial customer ratings. Firstly we use Trustpilot, it is a well established independent website where customers can rate brokers. Secondly, we use ForexPeaceArmy (FPA) which is a very well run community-driven rating site focused on fairness. One of the issues with review sites is that sometimes unhappy customers form the majority of reviews as they are an outlet for complaints, the happy customers feel no need to review the service as they are content. Vantage FX scores extremely well on the FPA rating website, with 3.2 stars, which is one of the highest ratings for CFD Brokers. The Trustpilot ratings are too few to matter and quite spammy, but even so, it rates as 3 stars. Vantage FX is a highly reputable broker with very happy customers and operating under one of the most stringent regulatory authorities in the world, the Australian Security and Investments Commission. As you can see Vantage FX are competitive across the board, the only decision you will need to make is the type of account you want. The Standard STP account is a Straight Through Processing (STP) account which enables direct market access to the big liquidity providers like hedge funds and investment banks, this is great for the trader because the broker is not taking the opposite side of your trade therefore not trading against you. Because it is an STP account you will pay a tight spread to fund the transaction with the liquidity providers. The RAW ECN and PRO ECN accounts use the Electronic Communications Network via MetaTrader. The ECN is a global hub where all the major liquidity providers connect to and compete to fill your order by offering the best prices. For the privilege of offering you the best price, they will be paid via $3.00 per lot on the Raw ECN accounts and $2.00 per lot on the PRO account. If you are a novice or intermediate trader go for the Standard STP account. If you are experienced go for RAW ECN and if you will be a frequent trader with a minimum account balance of $20,000 you can opt for the PRO ECN account. Vantage FX offers a good selection of 40 foreign exchange (Forex or Fx) pairs for trading. All the common pairs such as EUR/USD and EUR/GBP are covered, plus more exotic pairs such as NZD/JPN (New Zealand/Japan). Leverage is available up to 500:1 but of course, the leverage available to you depends, as with all brokers, on your account balance and experience. Trading Crypto is hot right now, and Vantage FX currently offer 6 Cryptocurrency pairs. You can trade Bitcoin, Bitcash, Ethereum, Litecoin and Ripple vs the U.S. Dollar at between 2:1 and 5:1 leverage. With a portfolio of only 100 shares CFD’s, Vantage FX is a little light in this department, with other brokers offering up to 3000 shares. The 100 shares you can trade are mostly U.S. Blue Chip companies. So if taking advantage of stock trading opportunities is your thing you might want to look at Plus500. In terms of indices, you will have access to the major European, American and Asian benchmarks including the DAX, Nasdaq, Dow, CAC, FTSE, ASX, Hang Seng, and the China A50, 15 in total at up to 200:1 leverage. Vantage FX does not offer Options trading via CFD’s. For those interested in commodities, there are 20 to choose from, which gives you enough to trade if your focus is on commodity futures. The usual commodities like Oil, Coffee, Corn, Wheat, Copper, Sugar, and Gas are available. Vantage FX aims to provide its customers with every possible choice of tool & trading platform. You have the choice of Vantage FX WebTrader or MetaTrader 4 / 5, cTrader for ECN Currency Trading, ZuluTrader for Copy Trading and MyFXBook. Of course, whichever desktop software you choose, you will still be able to trade from your tablet and smartphone. The MetaTrader 4 App has a 4-star rating on the Play store and in the Apple store 4.5-stars, which means you will get a great mobile trading experience. Ultimately you know you will be getting a solid and seamless experience however and wherever you choose to trade. You can use the Vantage FX Web Trader platform which is easy to use yet very powerful, this will give most retail investors what they need with a minimal investment in training and no installation required. Simple “one click to trade” enables you to execute the trade quickly. You have all order types available, so there is no pairing back of functionality with the online tool. Naturally, you get streaming real-time quotes, but the best thing is that the orders are processed using Straight Through Processing (STP) which means the order goes straight to the top tier liquidity providers to optimize order (Bid/Spread) pricing and execution. If you want to operate an ECN account with direct market access you can utilize the best, MetaTrader 4 or 5. MetaTrader will open up a world of automated trading and real-time streaming of news and events, it may take some time to work on your learning curve but it will be well worth it. The ECN is worth its weight in gold because you trade directly in a pool with other traders without the middle man or Market Maker, this is how you get spreads close to 0.0, but instead, there is a transaction fee commission on the trade due to the costs of operating the ECN. The ECN is not operated by Vantage FX, but they do have a Fiber link into the ECN for faster trade execution. There are no upfront costs associated with using the platforms available. Vantage FX was established in 2009 and it has developed a loyal following through its fair market access and customer service. The holding company is Vantage Global Prime Pty Ltd a privately held company supervised and regulated by the Australian Securities and Investments Commission (ASIC), one of the more stringent regulators out there. Opening a demo account is free, but to start trading you will need a minimum balance of $200 for a Standard STP account all the way up to $20,000 for a PRO ECN account. Minimum balances seem to be important to some people, but from my perspective, if you cannot afford $200, you probably should not be attempting to trade CFD’s. Vantage FX do not offer negative balance protection or guaranteed stops. This could be because of the nature of the service they offer. You cannot expect Vantage FX to offer guaranteed stops when they are offering a Straight Through Processing (STP) service. This means they are not acting at the market maker, which would allow them to offer negative balance protection and guaranteed stops, they are routing your trades through to a much more liquid market where it is not so protected. This has benefits to the trader because you are getting the absolute best bid and ask price spread, but the downside is that for complete beginners there is little protection. Finally, as per regulatory requirements, Vantage FX operates segregated accounts, meaning that your cash account is segregated from the accessible funds available to Vantage FX, simply meaning, they cannot use your funds to trade their own account. Also, there is insolvency compensation of up to 20,000 EUR in accordance with CySec regulations. Customer support is available on a 24/5 basis offering six regional phone numbers in Australia, UK, China, Canada and an international line. They also have online chat and email support, much more you cannot ask for. You can also see from their 5,000 twitter followers, there are few complaints about the service. 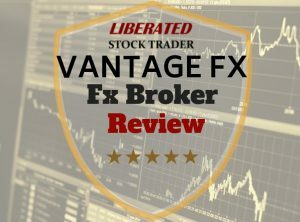 Vantage FX is a highly rated and reputable CFD Forex broker who really cares about offering their clients the best market conditions to trade in. A great set of trading platforms including MT4, MT5, WebTrade, and Zulu trade combined with a choice of STP and ECN routing, mean Vantage FX is one of the best companies operating today. A good reputation is important in this industry and they have it, a respectable Australian regulated company offering a great platform and a suite of signals, alerts and market updates to help their clients be profitable. Trade.com: Great for trading Stocks & ETF’s globally with beneficial ownership and straight through processing (STP), plus a large selection of CFD’s on Stocks, Forex, Bonds, and Commodities. Based in Cyprus and regulated by Cysec, Trade.com services U.K. clients. Trade.com & parent company Leadcapital Markets are a relatively new CFD broker and has been around since 2013. 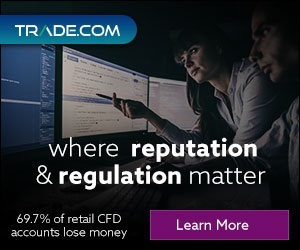 Based in Cyprus, Europe, Trade.com are focused on enabling their clients access to a broad selection of tradeable market assets while using the best platforms around, Webtrader, MT4 & MT5 for pure stock trading. Straight Through Processing (STP) on the live stocks account also means direct market access, lightning quick execution and no conflict of interest. Trade.com have very few ratings on the FPA rating website which makes it difficult to assess customer feedback. There are also not enough Trustpilot customer ratings to make it worth including. It is always worth performing your own research on the background of any CFD broker you choose. What we can say is that of the 700 followers they have on twitter, there are no negative tweets in the last 3 months. As you can see, there are 4 accounts starting at Basic with only a 100 $/Eur minimum. But if you deposit $2,500 you can open a classic account. This is worthwhile because you will be assigned a dedicated account manager, this is recommended because starting out trading contracts for difference and utilizing margin can be complex. It is people not understanding these complexities that often leave negative comments on ratings sites about CFD brokers. With a dedicated account manager you will get free one to one time with that person who can provide guidance on how the accounts, margin, and CFD’s work, most importantly they can advise on good account management of your portfolio, so you do not fall into any traps. The gold and platinum account will enable you to get complimentary access to Trading Central a 3rd party trading strategies, signals and research company. Finally, with the platinum account, you will receive premium service levels and responses for support. The Live stocks account is a Straight Through Processing (STP) account which enables direct market access, meaning you can buy or sell securities on all major global stock exchanges. This means the broker is not taking the opposite side of your trade therefore not trading against you. Because it is an STP account you will pay a tight spread to fund the transaction with the liquidity providers. It has an excellent selection of stocks and ETFs with low commissions. The commissions range from 0.05 USD per share for volumes under 10,000 share per month, to 0.007 USD for more than 500,000 shares per month traded. There is a minimum cost per trade of $1.50. With this account, you get MetaTrader 5 for free. 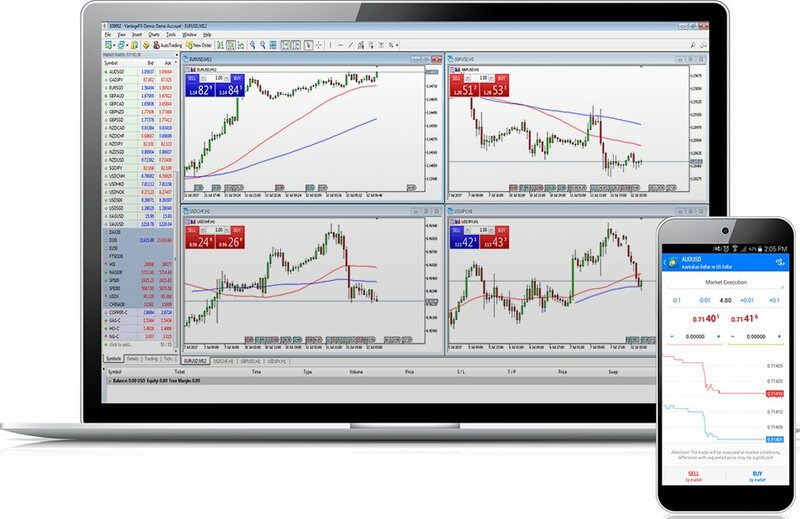 The MetaTrader 5 platform is one of the most advanced and effective multi-assets trading platforms available. Trade.com offers a huge selection of up to 62 foreign exchange (Forex or Fx) pairs for trading. All the common pairs such as EUR/USD and EUR/GBP are covered, plus more exotic pairs such as NZD/JPN (New Zealand/Japan). Leverage is available up to 300:1 for professional accounts and 20:1 for retail accounts. As mentioned previously, you can trade stocks via a CFD account (Webtrader or MT4) or a Live Stocks (MT5) account. In terms of ETF’s, there are over 30, covering France, Germany, U.K and the U.S.A. There are 26 different indices covered via CFD’s. Trading Crypto is hot right now, and Trade.com currently offer 4 Cryptocurrency pairs, Bitcoin, Dash, Ethereum & Litecoin. For those interested in commodities, there are 36 to choose from, which gives you the biggest selection of all the CFD brokers we have reviewed, so if your focus is on commodity futures then this is a good choice of broker. The usual commodities like Oil, Coffee, Corn, Wheat, Copper, Sugar, Orange Juice and all the metals are available. Trade.com aims to keep it simple and straight forward when it comes to choice of tools, you have the choice of WebTrader, MetaTrader 4 or MetaTrader 5. Of course, whichever desktop software you choose, you will still be able to trade from your tablet and smartphone. 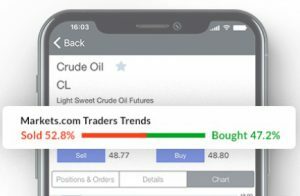 The MetaTrader 4 App has a 4-star rating on the Play store and in the Apple store 4.5-stars, which means you will get a great mobile trading experience. Ultimately you know you will be getting a solid and seamless experience however and wherever you choose to trade. 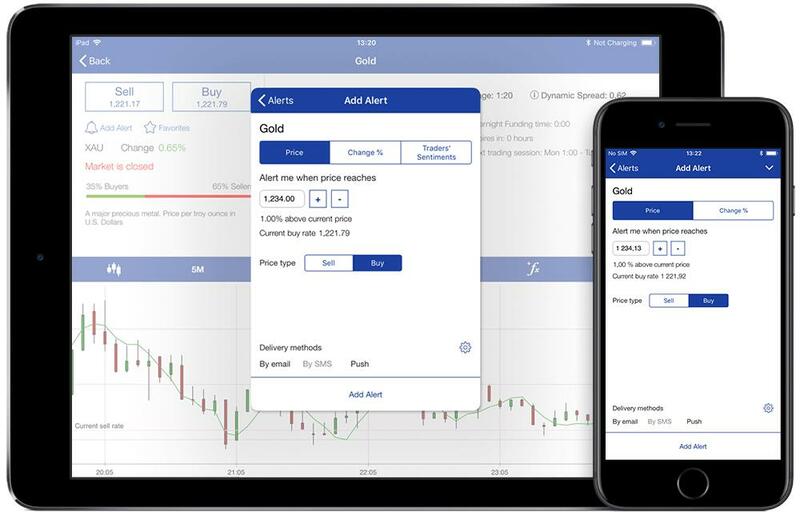 You can use the Web Trader platform which is easy to use yet very powerful, this will give most retail investors what they need with a minimal investment in training and no installation required. Simple “one click to trade” enables you to execute the trade quickly. You have all order types available, so there is no pairing back of functionality with the online tool. Naturally, you get streaming real-time quotes. 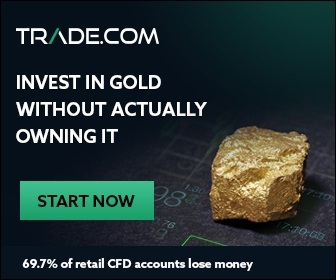 Trade.com provides complimentary access to Trader Central a respected 3rd party service for gold and platinum account holders, for this you will need an opening balance of $10,000. Email and video trading signals and analysis through Trading Central are focussing on specific high probability setups. Trade.com also provide daily market update videos filmed directly from their head office trading floor and are providing in English, German, Spanish and Italian languages. Their various youtube channel host thousands of educational and market update videos and their own private channels for registered clients provide daily briefings. They also have live webinars and have a good selection of training videos and resources. Trade.com was established in 2013 in Cyprus, Europe. The holding company is Leadcapital Markets Ltd a privately held company supervised and regulated by Cyprus CySec. Opening a demo account is free, but to start trading you will need a minimum balance of $100 for retail accounts. Minimum balances seem to be important to some people, but from my perspective, if you cannot afford $1,000, you probably should not be attempting to trade CFD’s. Trade.com do offer negative balance protection for all retail CFD accounts. Also, as per regulatory requirements, Trade.com operates segregated accounts, meaning that your cash account is segregated from the accessible funds available to Trade.com. Simply meaning, they cannot use your funds to trade their own account. Lastly, there is insolvency compensation of up to 20,000 EUR in accordance with regulations. Customer support is available on a 24/7 basis offering call-in numbers in Cyprus. If you want the best level of service and support I would recommend the Classic, Gold or Platinum accounts as you will have your own dedicated account manager to help you get up to speed and to provide training and guidance. You can also see from their 700 twitter followers there are few complaints about the service. Trade.com is focused on providing a broad selection of assets to trade via CFD’s and real beneficial ownership accounts. A good set of trading platforms are provided for free including MT4, MT5, and their own Trade.com web application. What I like the most is the Live Stocks account which opens up the world of U.S. stocks and ETF’s to their customers around the globe. Easy direct market access and straight through processing to the large exchanges and liquidity pools means fast execution and low commissions plus you actually own the stocks. Risk Warning: 71.36% of retail investor accounts lose money when trading CFDs with this provider. There you have it, in my experience, Forex.com one of the biggest UK brokers and Vantage FX one the best global brokers make the cut. Both offer direct market access via ECN with a tantalizing suite of tools and razor thin margins. Make your choice, are you a power trader searching for the ultimate platform, then choose Vantage FX, or do you need a strictly UK based FTSE 250 and NYSE listed company that also offer a great reputation and service, then choose Forex.com. The final alternative is Trade.com who uniquely offer US stock and ETF trading with beneficial ownership of the assets, meaning you own the stocks and you also get a personal account manager. CFD Risk Notice ESMA & FCA Risk Warning - "CFDs are complex instruments and come with a high risk of losing money rapidly due to leverage. Between 74% and 89% of retail investor accounts may lose money when trading CFDs with any provider. You should consider whether you understand how CFDs work and whether you can afford to take the high risk of losing your money. Capital at risk"
We thoroughly background check the brokers we recommend and only list reputable trustworthy companies. Read our tips to perform your own background checks, and test a broker after you sign up. You can perform your own check easilly. LiberatedStockTrader.com accepts no responsibility for your experience with any broker. Did You Like This Review? Do You Have Experience With Any Of The Mentioned Brokers? Leave Us A Message Below. Barry D. Moore is a Certified Market Analyst with the International Federation of Technical Analysts with over 20 years of Investing experience, Author & Leading Investment Blogger. Previous lives include holding key executive roles in Strategic I.T. & Business Model Development for Silicon Valley Global Corporations. Learn more about why Liberated Stock Trader was Founded. Follow Me on TradingView Our Review Winning Trading Platform. This is an independent, unbiased resource for learning to invest. Liberated Stock Trader receives no payments from any company whose stocks are discussed and promotes no particular stock. If the author holds a stock it will be disclosed in the article. We do, however, have affiliate partnerships with companies whose products we love. We may receive payment when you purchase a 3rd party product reviewed by us, these payments fund this business. We will never share your details with any third party. This site is provided to you for informational purposes only and should not be construed as an offer to buy or sell a particular security or a solicitation of offers to buy or sell a particular security. The authors & contributors are not registered financial advisors and do not give any personalized portfolio or stock advice.